Frequently Asked Questions: Fishing Waders And Wading Accessories – Watchy! What do you think before you choose a pair of fishing waders? Do you buy them for just fishing or other hunting activities? If you plan to use it for fishing more than other kinds, you need to think about the fishing waders and their specific features. You also should consider the fishing type you intend to do. Obviously, when you’re fishing from your boat during the day, choosing the best breathable waders is not necessary. If you aren’t in that case, you need to think of the water temperature and weather on the day you’ll go. It’s always best to choose the fit waders with the outside features and your fishing requirements. This pair should be stout or regular models. Ultimately, the fit boots will decide your comfort so it’s extremely important to choose the pair that fits correctly. The wading boots run true to size, and then you can order the range you commonly wear in regular boots or shoes. If you frequently use a half size, you should get the next lowest size. For instance, if your normal shoes have 10.5 in size, you need the waders 10 in size. Breathable waders are more versatile and lightweight while neoprene waders have more advantages of insulating and protecting from cold weathers. You can think of the breathable type as the most versatile waders that are suitable for waterfowl hunting since they offer more warmth within smart layering. In neoprene waders, you feel less comfortable since the insulation is applied into the waders. Breathable waders are perfect for almost weather conditions, especially on warmer days. The best ones are designed with three-layer fabrics including high-quality waterproof membranes and durable shell fabrics for withstanding bad fishing conditions. This fabric is less restrictive than neoprene and offers more comfort of movement. Because of no insulation, they’re quite comfortable in high temperatures when you want to wear light shirts and pants inside your waders. Besides that, you can also use them in winter and cold water by wearing more layers underneath. At all main measurement points, such as the calf, knee, thigh, hip, waist and chest, the stout sizes are larger than the regular sizes. In the inseam, the stout size is shorter. Picking between a stout or regular model depends on your inseam and physical build. The regular waders often are suitable for hunters with frequent to long inseam lengths. 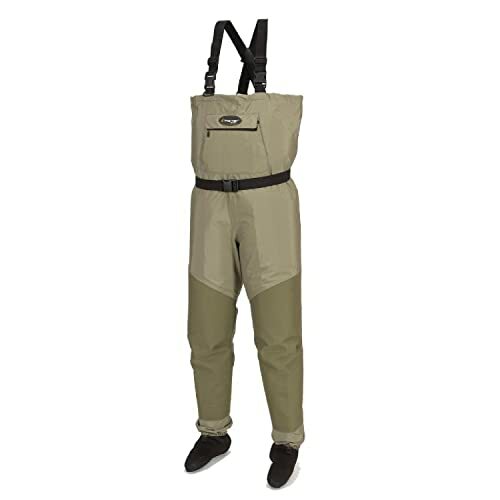 The stout waders include a shorter inseam and provide extra space in the chest, calf area, and hip. Browse the size chart of the local fishing stores or online shops to find the proper wader selection. I notice this since some people don’t pay attention small accessories for wading. Wearing both a wading belt and hip pack isn’t the most comfortable choice. However, if the water is roaring or you fall into the river, you’ll need the entire protection for waders that don’t fill in water immediately. Now matter what waders you use, ensure the wading belt is snug and nice. This is a good option to provide for you more reliable, better and easier to use. You can choose the model that is able to attach to the belt until you need to use it. Except offering the stability when you cross a river, the wading staff is ideal to check the water depth along the bank. If you have once used it for the wading trip, you would know that it’s reliable and important for your safety. Fishing is more enjoyable and relaxing than simply sitting at a spot. To have the better catch, you need good baits, but for the fun and safe trip, you need good waders and accessories. The trip really becomes boring if you take serious time for preparation. With high-quality fishing gears, you can wade and fish during the day, even in cold waters.